THE ANNUAL WESLEYAN CHURCH CONFERENCE is always a highly anticipated event in Tonga. The conference in 2007, June 12 to 21, was no exception, although no one could have forseen the grave sadness we all experienced when on the second day our good friend Kalipoli died of a heart attack. He had travelled with our party from Ha'apai to the Jubilee in Vava'u just weeks earlier, and was in his usual good spirits as we made the journey down to the conference. He is missed very much by all of us. But the conference went on, albeit on a more somber tone than is usual. 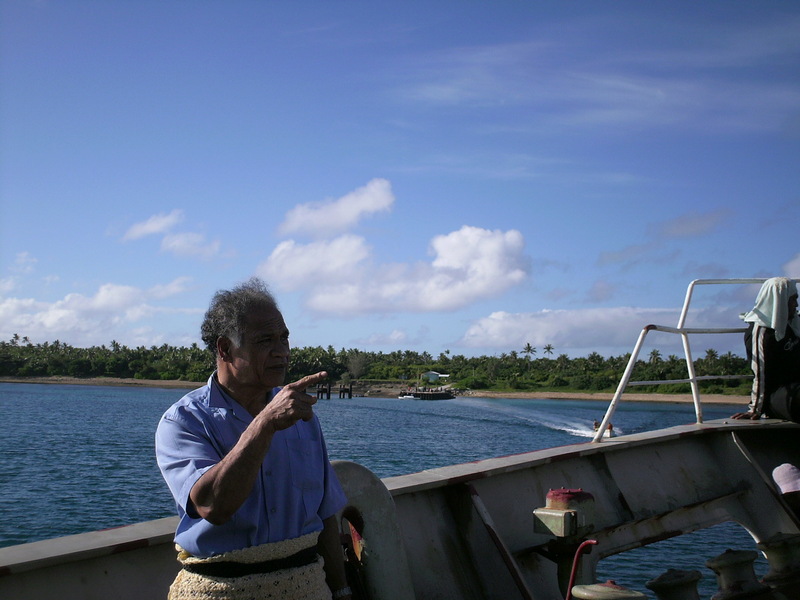 I had been living in Ha'apai at the time, and Kalipoli was the head of the Wesleyan church in the Ha'apai district. I had grown very fond of him, and he had been very supportive of my music activities. There was a period where his secretary's computer broke almost on a weekly basis, and he would pay me to fix it over and over. I wondered if he was just acting as an additional financial support for me, or if his secretary really didn't know how to take care of her computer. When Poli passed away, to me it was like my best friend was gone. Ha'apai was never the same for me without Kalipoli. I used to say I would want to be buried next to Shirley Baker, and now that would be right across the road from Kalipoli. There were several stops on the way to Nuku'alofa, including Tungua, Ha'afeva and Nomuka. In these places the small boats come out to meet the ferry and people and goods are tossed back and forth from the ferry boat's lower doorways. I remember one trip on the ferry boat, watching as they threw a little girl's pink suitcase, a little girl's pink bicycle, and then you guessed it, they threw a little girl in pink sleepers into the waiting arms of her uncle on his fishing boat at Nomuka. They are very experienced at this and there is no danger of ever dropping any precious cargo. I snapped this picture of Kalipoli while we were at Ha'afeva. I remember passing by the island of Lofanga in Ha'apai because Kalipoli is from that island in the Ha'apai group. I had been trying to learn all of the names of the islands in the Ha'apai district from memory when living there. It was wonderful weather for a ferry trip, although that is not always the case. Coming back from Vava'u a few weeks earlier, the sea was very rough and the waves were crashing completely over the Pulupaki. Once we arrived in the capitol, we were all very well taken care of. 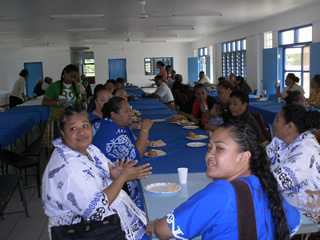 The staff and students of Queen Salote College must be commended for their truly Tongan hospitality. From the band playing at the wharf we were all bussed to the campus where a delicious snack had been prepared for us. We all roomed in either dormitories or classrooms converted into sleeping rooms. There were many of the same goodfellas in my sleeping room whose company I had enjoyed at the Jubilee up in Vava'u. It was a grand reunion of sorts. As you might imagine, with the great number of visitors, rooming space was at a premium and the beds were placed edge to edge. Good thing nobody snores, well, not me! My favorite part of these events is actually the singing that goes on in the massive Centennial Church. 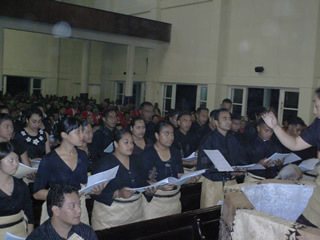 There were Tongan choirs from all over the world: all parts of Tonga, New Zealand, Australia, the USA, Fiji and Hawaii. The order of the day is George Frederic Handel, with all parts of the Messiah and Zadoc the Preist particular favorites. I shall never tire of hearing the Tongans sing this fine music when it is done well, and they shall probably never waver from these selections. Perhaps a choir might try and squeeze in some Purcell or Byrd? I think that would be nice, but I don't expect this to happen anytime soon. 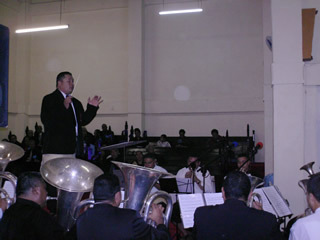 Most of the choirs are accompanied by small orchestras. In the past there has been a string orchestra from Wellington NZ, but mostly it is brass ensembles. One trend I have noticed over the years is the addition of Yamaha keyboards to the choir accompaniment. Now you will find this in most of the Wesleyan church Sunday services. They favor using a very thick string ensemble sound played at a very loud volume. To me this drowns out the choir. 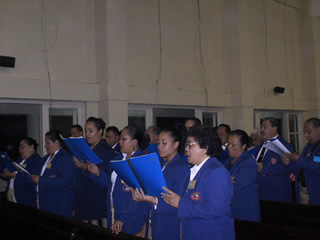 The Tongan schools, including my own, have very active brass programs. They use either the Tongan numeric notation, or more commonly the "World Notation" system of all parts in treble clef, transposed to either Bb or Eb. The variety of conducting skills runs the gamut from very good sound technique to "What the heck was that?". This leads to an occasional extra beat or missing beat in the extreme cases, but no matter because the magnificent sound wins the day in all cases. We could give a conducting workshop for Wesleyan bandmasters at some point in the future, but I doubt many would attend. It was my great joy to perform with the Atenisi Institute choir (Atenisi Performing Arts Center) once again. With Sisiuno Helu conducting and her sister Makhe singing the soprano solos, it was a big hit, as always. I was greatly uplifted to see Distinguished Professor Futa Helu present at these the APAC performances, happy to know his health was strong enough to permit his smile to grace the proceedings. Sadly we lost Futa a few years later but his children still carry the legacy. He was one of the most brilliant men I have ever known in my life, a great inspiration to me. Of course I also enjoyed a few cups of kava with the Atenisi crew while visiting Nuku'alofa. But let us not forget the mantra of attending a church conference: mohe (sleep), lotu (pray), kai lahi (eat big), repeat. These massive feasts, three times each day for 10 days, do actually change the food supply for the entire kingdom. People in other churches or who do not attend the conference always remark (sometimes heatedly) about the scarcity and increased prices of fish, eggs, and other staples during the period leading up to the conference. I try not to let their misfortune disturb my non-stop consumption of lobster and fresh fruit. Alright, I am joking. All of us Wesleyan missionaries have to find our own way to accept or adapt to Tongan culture. Many have stopped going to feasts altogether, but they don't mind if I bring them a crab now and then.